Introduction Exercise programmes are used in the prevention and treatment of adductor-related groin injuries in soccer; however, there is a lack of knowledge concerning the intensity of frequently used exercises. Objective Primarily to investigate muscle activity of adductor longus during six traditional and two new hip adduction exercises. Additionally, to analyse muscle activation of gluteals and abdominals. Materials and methods 40 healthy male elite soccer players, training >5 h a week, participated in the study. Muscle activity using surface electromyography (sEMG) was measured bilaterally for the adductor longus during eight hip adduction strengthening exercises and peak EMG was normalised (nEMG) using an isometric maximal voluntary contraction (MVC) as reference. Furthermore, muscle activation of the gluteus medius, rectus abdominis and the external abdominal obliques was analysed during the exercises. Results There were large differences in peak nEMG of the adductor longus between the exercises, with values ranging from 14% to 108% nEMG (p<0.0001). There was a significant difference between legs in three of the eight exercises (35–48%, p<0.0001). The peak nEMG results for the gluteals and the abdominals showed relatively low values (5–48% nEMG, p<0.001). Conclusions Specific hip adduction exercises can be graded by exercise intensity providing athletes and therapists with the knowledge to select appropriate exercises during different phases of prevention and treatment of groin injuries. The Copenhagen Adduction and the hip adduction with an elastic band are dynamic high-intensity exercises, which can easily be performed at any training facility and could therefore be relevant to include in future prevention and treatment programmes. There is consistent evidence that previous groin injury increases the risk for subsequent groin injury.1 ,5 ,9 ,10 A common assumption is that strength deficits due to inadequate rehabilitation is a possible reason for previous injuries being a risk factor.1 ,5 ,9 Additionally, reduced hip adductor strength has been found to be a risk factor for subsequent groin injury.9 ,11 Therefore, hip adduction strengthening exercises seem to have a large potential in both the prevention and treatment of groin injuries. Currently, no studies have been able to demonstrate a reduction in the number of groin injuries in soccer.12–14 Various explanations for this have been proposed, such as insufficient compliance,12–14 overoptimistic effect sizes12 and inadequate exercise intensity.12 Physical training has proven effective in the treatment of long-standing adductor-related groin pain,15 which is supported by other studies showing favourable outcomes of exercise interventions.16 None of the aforementioned studies,12–15 17–20 however, account for the intensity of the included exercises, that is, relative load, perceived exertion or muscle activity. Consequently, no information exists on the specific intensity of exercises in the treatment of groin pain in athletes. In this regard, electromyography is a pertinent method of evaluating exercise intensity.21–24 The results of the present study could therefore be used to optimise future training programmes by a greater understanding of exercise intensity when selecting exercises to match different contextual situations and physiological demands in prevention and treatment of adductor-related groin injuries. The primary purpose of this study was therefore to examine the muscle activity, defined as the peak normalised EMG signal (nEMG) of the adductor longus during six traditional and two new hip adduction strengthening exercises. Additionally, muscle activity of the gluteus medius, rectus abdominis and external abdominal oblique was evaluated. Forty healthy male elite soccer players older than 18 years participated in the study (21.4±3.3 years, 182.4±7.9 cm, 77.8±7.9 kg). The participants were recruited on a voluntary basis through coaches and physiotherapists from teams from the Danish Senior 1st Division, 2nd Division and the Under-19 League. All participants were training >5 h per week with 1–2 weekly matches. Players were eligible for inclusion if they did not have current hip or groin symptoms and/or injury or other injuries which could be presumed to influence the execution of the tests. As a large proportion of soccer players experience mild hip and groin symptoms and disability, that may not be perceived as problematic by the player, a score higher than 80 out of 100 in the subscale ‘function, sports and recreational activities’ from the Copenhagen Hip and Groin Outcome Score,25 HAGOS (Sport), was required. Furthermore, we decided to exclude players if they reported pain >2 on a numeric pain rating scale in the Adductor Functional Pain Test26 during maximal voluntary contractions (MVCs) and during the performance of the eight exercises. Inclusion of participants ended when the desired sample size was reached. No exercise or training was allowed on the same day before testing and all participants gave written informed consent according to the Helsinki Declaration before testing was initiated. The study was approved by the Danish National Committee on Health Research Ethics (H-3-2011-145). The participants attended two separate test sessions. On the first session, they performed a 10 min standardised warm-up and were subsequently familiarised with all the exercises. The second session was conducted with a minimum of 3 days’ interval to avoid delayed onset muscle soreness (DOMS). After the warm-up, the players performed the MVC tests followed by the eight exercises. The present study included six traditional hip adduction exercises12 ,15 ,27 ,28 and two new exercises which were considered to activate the hip adductor muscle group with a different intensity (figure 1). We wanted to introduce exercises that we thought would represent both high and low intensities, as this can be useful in clinical situations, such as acute versus chronic conditions, where muscle-tendinous structures need to be targeted with different intensities. Only exercises where the hip adductors were used as a prime mover in hip adduction were included to ensure similar muscle actions in our comparisons. The preferred kicking leg was defined as the dominant leg and was used as the training leg when performing the exercises. The eight included hip adduction exercises: (a) isometric adduction with a ball between the ankles; (b) isometric adduction with a ball between the knees; (c) side-lying adduction; (d) sliding hip abduction/adduction exercise; (e) hip adduction with an elastic band; (f) hip adductor machine; (g) supine bilateral hip adduction; (h) Copenhagen adduction. The exercises were performed in a randomised order and a minimum of 30 s break was held between the exercises.29 EMG increases due to fatigue with consecutive repetitions within a set performed to failure,30 but not between consecutive sets with rest periods in between.31 To avoid fatigue, the subjects therefore performed two separate sets and the dynamic exercises were performed with three repetitions and one repetition for the isometric exercises in each set. All exercises were performed for 6 s per repetition: 3 s concentric and a 3 s eccentric contraction for the dynamic exercises, with a gradual increase and decrease of tension for the six second isometric exercises. For the two exercises that can be adjusted using an external load, the hip adductor machine and the hip adduction with an elastic band, a relative load of 10 repetition maximum (RM), was chosen. The load on the machine and the resistance of the elastic bands (number and strength of the elastic bands and distance from the fixation point) were individually determined on the first session. The participants subjectively evaluated the exercises after 5–6 repetitions and adjusted the load accordingly. Ten repetitions were performed and the relevant load was noted if participants considered the load equivalent to 10 RM. A load of 10 RM is described as heavy resistance training32 and has been used previously in hip adduction strengthening,27 and therefore it is considered as an appropriate reference for exercise comparisons. Isometric adduction—with a ball between the ankles (IBA): Isometric hip adduction against a football placed between the feet inferior to the medial malleoli when lying supine. The knees are kept straight and feet vertical. The feet are pressed against the ball as hard as possible. Exercise used in refs. 12 15 28. Isometric adduction—with a ball between the knees (IBK): Isometric hip adduction against a football placed between the knees when lying supine with hips and knees flexed and feet flat on the surface. The first toe is pointed straight forward and the knees are pressed against the ball as hard as possible. Exercise used in refs. 12 15 28. Side-lying hip adduction (SLA): The player is lying on the side of the dominant leg with the dominant leg straight and the non-dominant leg flexed 90° in the hip and knee. Maximal hip adduction of the dominant leg is performed keeping the knee straight and foot horizontal. Exercise used in ref. 15. Sliding hip abduction/adduction (SLIDE): Standing with the dominant leg on a wash cloth with hips and knees straight and hands placed laterally on the trunk. The dominant leg is abducted, so the centre of gravity moves laterally as much as controllably possible. The dominant leg is then adducted, sliding back to the starting position. Exercise modified from refs. 15 28. Hip adduction with an elastic band (EB): Standing with the hip of the dominant leg positioned in maximal abduction. An elastic band (Thera-Band) is attached to a fixation point and around the ankle of the dominant leg keeping a slight tension in the elastic band from the beginning. The upper body is kept straight and the player holds on to a stable support. The dominant leg is adducted until there is a foot width between the feet and the dominant leg is approximately half a foot length behind the foot of the non-dominant leg. Exercise modified from refs. 15 27 28. Hip adductor machine (AM): Sitting in a hip adduction machine, ‘Adductor’ (TechnoGym, Bologna, Italy), with a slight knee flexion holding on to the handles. The legs are then moved into maximal hip abduction and back. Exercise used in ref. 28. Supine bilateral hip adduction (SBA): Supine with the hips in 90° flexion and the knees in 45° flexion. The legs are moved into maximal hip abduction and back keeping the flexion in the hips and knees constant. New suggested low-intensity exercise. Copenhagen Adduction (CA): A partner exercise where the player is lying on the side of the non-dominant leg with one forearm as support on the floor and the other arm placed along the body. The dominant leg is held in approximately the height of the hip of the partner, who is holding the leg with one hand supporting the ankle and the other supporting the knee. The player then raises the body from the floor and the non-dominant leg is adducted so that the feet touch each other and the body is in a straight line. The body is then lowered halfway to the ground while the foot of the non-dominant leg is lowered so that it just touches the floor without using it for support. New suggested high-intensity exercise. Bipolar disposable silver/silver chloride (Ag/AgCl) surface electrodes (White Sensor, Ambu A/S, Ballerup, Denmark) were used bilaterally to collect data from the adductor longus, gluteus medius, rectus abdominis and the external abdominal oblique. The electromyography (EMG) activity was sampled at 1024 Hz using two sets (4 channels each) of the Nexus 10 data loggers (Mind Media, The Netherlands) and digitally converted at a 24 bit resolution using integrated A/D-converters. To reduce impedance, the area where the electrodes were placed was shaved and cleansed with an abrasive gel (Acqua gel, Meditec, Parma, Italy). Adductor longus: medially on the thigh equivalent to the proximal third of the distance from the pubic tubercle to the insertion on the femur.34 ,35 Gluteus medius: half the distance between the iliac crest and the major trochanter anterosuperiorly from the Gluteus Maximus.33–36 Rectus abdominis: half the distance between the umbilicus and the pubic symphysis37 and centred on the muscle belly, that is, 2–4 cm laterally from the midline depending on the size of the participant. External abdominal obliques: directly below the most inferior point of the costae in direction towards the opposite pubic tubercle.38 ,39 Reference electrodes: on the medial surface of the tibia. All electrodes were fixated with tape (Fixomull Stretch, BSNmedical, Germany). Adductor longus MVC: a bilateral hip adduction was performed supine with the hips and knees straight and a ball placed between the knees. Gluteus medius MVC: a maximal hip abduction was performed side-lying with knees straight and the tested leg in 25° s of hip abduction.36 ,41 A strap belt around the knees just proximal of the lateral femur epicondyle was used as it has been shown to increase the reliability of maximal hip abduction measurements.42 Rectus abdominis and external abdominal obliques: Two test positions were performed to ensure the highest magnitude of muscle activity.43 A straight abdominal flexion in an ‘Abdominal Crunch R.O.M’ machine (TechnoGym, Bologna, Italy) and a trunk rotation in a ‘Rotary Torso’ machine (TechnoGym) to each side. Both MVCs were performed isometrically with the resistance and movement of the machines locked. All raw EMG signals were digitally filtered by a Butterworth fourth-order high-pass filter (10 Hz cut-off frequency). Raw EMG was checked visually on a computer and processed to ensure correct signal registration. For each individual muscle, a moving root mean square (RMS) EMG (500 ms time constant) was used to identify peak EMG within each contraction (repetition) and normalised to the maximal moving RMS EMG (500 ms time constant) obtained during MVC.22 ,30 ,31 Reported peak nEMG for each exercise was calculated using the average of the peak nEMG from all repetitions, that is, six repetitions for the dynamic exercises and two repetitions for the isometric exercises. Intraclass correlation coefficient (ICC) model 3 was used to determine the intrasession reliability of the repetitions (six dynamic and two isometric) using the peak nEMG from all subjects in each exercise. As a reference, ICC values >0.75 were considered excellent and 0.40–0.75 fair to good.44 A repeated-measure one-way analysis of variance (ANOVA) was used for the evaluation of peak nEMG for each muscle with nEMG as the dependent variable and exercise as the independent variable. A post hoc analysis was made to compare the exercises and a Bonferroni correction was made to account for the risk of mass significance, that is, all p values presented have been multiplied by the relevant number of pairwise comparisons. When comparing differences between the adductor muscle activity of the two legs, a two-way ANOVA was used to test for muscle by exercise interaction, with nEMG as the dependent variable and muscle (dominant and non-dominant adductor longus) and exercise as independent variables. All nEMG values are reported as least square mean±SE and the level of significance was set at p<0.05. The SD in nEMG for leg exercises has been shown to be approximately 15%.24 The minimal clinically relevant difference between exercises has been suggested to be 10% nEMG.22 ,45 With a power of 80% (β 0.80) and a significance level of 5% (α=0.05), the minimum number of participants was calculated to be 20. To account for multiple comparisons and missing data (eg, due to electrode errors etc. ), we decided to include 40 participants. Data from two participants were missing due to broken reference electrodes. Therefore, the analysis included 38 participants (table 1). Full datasets were registered for 35 participants and data from three participants had a total of 18 single contraction measurements showing uncorrectable registration errors, which led to their exclusion from the respective analyses. Analysis of peak EMG values was therefore conducted to account for the missing values. For the majority of the exercises, excellent ICC values were found between the repetitions for adductor longus (ICC 3=0.81–0.97). The ICC values for the dominant adductor longus in the isometric adduction with the ball between the knees and between the ankles were fair to good with an ICC of 0.59 and 0.74, respectively. We found a significant exercise by muscle interaction (ANOVA: p<0.0001) for the adductor longus, as well as a significant difference between the exercises for the gluteus medius, rectus abdominis and the external abdominal oblique muscles (ANOVA: p<0.0001). See table 2 for specifications. The post hoc analysis of adductor longus activation (table 3) showed that the supine bilateral hip adduction had significantly lower values than all other exercises (p<0.01). The side-lying hip adduction was significantly higher than the supine bilateral hip adduction and significantly lower than all the other exercises (p<0.01). Furthermore, there was a significant difference from the three exercises with the highest nEMG activity and the three lowest ranked exercises (p<0.05) (table 3). Three of the exercises, the Copenhagen Adduction, the hip adduction with an elastic band and the side-lying hip adduction, had significantly higher adductor longus activation in the dominant leg (training leg) compared to the non-dominant leg (non-training leg), 35–48%, p<0.0001 (figure 2). Consequently, these exercises can be considered asymmetric regarding intensity. Mean peak nEMG for the dominant and the non-dominant adductor longus. nEMG=Normalised electromyography; Dominant leg=The preferred kicking leg. * Denotes a significant difference between the dominant and the non-dominant leg. IBK, isometric adduction with a ball between the knees; CA, Copenhagen adduction; EB, hip adduction with an elastic band; AM, hip adductor machine, SLIDE, sliding hip abduction/adduction exercise; IBA, isometric adduction with a ball between the ankles; SLA, side-lying adduction; SBA, supine bilateral hip adduction. The main purpose of this study was to evaluate the exercise intensity using sEMG to measure muscle activity during the hip adduction exercises frequently used in the prevention and treatment of adductor-related groin injuries. The findings of this study show that there is a significant difference in muscle activation between the included exercises. This evaluation of exercise intensity can help guide clinical decision making by an increased understanding of ways to progress strength training exercises in the prevention and treatment of adductor-related injuries. The results show that seven exercises can be considered strength training, as they elicit an intensity higher than 60% of maximum, which is documented to be conducive of muscle strength gains.46 Furthermore, it could be assumed that it is possible to regulate the intensity of some of the exercises by changing the RM, both to a higher or lower relative load or by pressing submaximally on the ball in the isometric exercises. There was no significant difference between the five exercises with the highest nEMG values. These exercises are all performed in different test positions and with different kinds of equipment (elastic band, machine, wash cloth, ball or without anything), allowing the clinician to choose the exercises which fit the players’ situation and preferences best. This also shows promising possibilities for implementing strength training on the pitch for football players, as the Copenhagen Adduction exercise, the hip adduction with an elastic band and the isometric hip adduction with a ball between the knees all can be performed at any training facility with a minimum of equipment needed. The optimal number of sets, repetitions and frequency of the exercises is, however, beyond the scope of this study. There is limited research investigating adductor longus muscle activity during exercise. A review investigating the free barbell squat finds that a greater hip external rotation position, a wide stance of the feet, as well as an increased load will increase hip adduction activation during the exercise.47 The highest nEMG value found for the hip adductors was, however, only 23.1%.48 A different study, which investigated adductor longus activation during a single-leg squat, a lunge and a step up-and-over exercise, showed peak nEMG values at 15–19%, 8–21% and 15–22% nEMG, respectively.49 The relatively low nEMG results found in these exercises indicate that they probably do not sufficiently activate the adductors to achieve strength increases and hypertrophy. Consequently, seven exercises from the present study appear to be superior in that respect, as they all focus primarily on the hip adduction movement, thereby reaching greater levels of muscle activity. These movements can result in large amounts of stretching of highly activated muscles (lengthening contractions), which are associated with muscle injuries.53–56 Additionally, these movements create large stabilisation requirements around the hip, which if inadequate might also be a risk factor for injury. This was demonstrated in a study of ice hockey players, where a muscular imbalance with a preseason hip adduction/abduction strength ratio less than 80% increased the risk of sustaining an adductor muscle strain in the following season by 17 times,57 emphasising the importance of ensuring adequate strength of the adductors. Our findings show a significant asymmetry in muscle activation between legs in three exercises. This information can assist in the selection of exercises, for example, if a differentiated training load between legs is desired. We found no significant differences in muscle activation between legs in the symmetrically performed exercises. Previous research has documented strength asymmetries between legs in elite soccer players61 ,62; however, there is no indication that this has any influence on our EMG findings in the symmetrical exercises. The muscle activity of the secondary muscles (abdominals and gluteals) all show values of less than 49% nEMG. Consequently, the included exercises are not ideal for strength training of these specific muscle groups in healthy athletes. In comparison, other studies have found values at 16–32% nEMG and 39–64% for the external abdominal oblique and rectus abdominis, respectively, during abdominal crunch exercises.63–66 Both considerable movement and stabilisation of the trunk are required in soccer, especially during kicking,67 and recurrent stress on the abdominal muscles during soccer has been suggested to be involved in the aetiology of groin pain.68 Therefore, choosing exercises with a high abdominal activation also seems relevant in relation to groin injuries. To target the abdominal muscle-tendinous structures to some extent, through the exercises included in the present study, the Copenhagen Adduction exercise seems preferred, as it shows the highest values for the abdominal muscles reaching 36% and 40% peak nEMG for the external abdominal oblique and rectus abdominis on the non-dominant side, respectively. The present study was conducted on male soccer players only and therefore limits the generalisation to this group. Consequently, we cannot conclude that the results are applicable to females, other types of athletes, players with pathologies or the general untrained population. Surface EMG is subject to various limitations, as the EMG signal is influenced by factors such as thickness of tissue layers, possible cross talk, electrode shifting, changes in muscle tissue conductivity, etc.69 ,70 To reduce variability as much as possible, the same tester conducted the preparation of all participants using a precisely described placement of electrodes. Additionally, this study utilised standardised reference contractions. Furthermore, a 500 ms RMS window was used in the analysis to minimise the influence of rapid changes in muscle activity during the repetitions. The literature lacks consistency in the description of MVCs for the adductor longus.49 ,51 ,71 ,72 Consequently, the MVC test position was chosen because the majority of the exercises in the present study are performed with the hips and knees straight. We found that the MVC had a lower peak EMG than some of the exercises. Therefore, the results of the present study might not be reproducible when using a different MVC test for normalisation. Based on the results of this study, an isometric hip adduction with hip and knee flexion and a ball between the knees should be considered as an MVC in future studies concerning adductor longus EMG measurements. Two ICC measurements for the dominant adductor longus showed less than excellent values. These were from the isometric exercises. We did not find any significant differences in peak nEMG between legs in the isometric exercises, and as the ICC values for the EMG activity in the non-dominant leg in the isometric tests were excellent (0.89), we do not consider the lower ICC values for the dominant leg to have a significant influence on our findings. This could be due to the large sample size reducing this possible measurement variation. The use of a Bonferroni correction in the post-hoc analysis is a very conservative approach and increases the risk of type 2 errors, that is, false negatives. The post-hoc analyses show significant differences for the three exercises with the lowest peak nEMG, but not between the five exercises with the highest peak nEMG. These five exercises were, however, all within 10% nEMG, which was predetermined as clinically irrelevant. Thus, a possible type 2 error is not considered to be of clinical relevance. Specific hip adduction exercises can be graded by exercise intensity, providing athletes and therapists with the knowledge to select appropriate exercises during different phases of prevention and treatment of groin injuries. The Copenhagen Adduction and the hip adduction with an elastic band are dynamic high intensity exercises, which can easily be performed at any training facility and therefore seem relevant to include in future prevention and treatment programmes. Specific hip adduction exercises display different levels of adductor longus muscle activity, indicating differences in exercise intensity between specific exercises. This enables a deliberate choice of exercises based on intensity, which is relevant in different phases of prevention and treatment of groin injuries. The Copenhagen Adduction exercise and the hip adduction exercise with an elastic band are dynamic high-intensity exercises with limited or no equipment. Therefore, they have great potential for on-field prevention and treatment programmes. The authors would like to thank all the players who took the time to participate in the study, as well as David Visvanathan and the team of physiotherapy students for their help with the practical work during the tests. Anders Vinther, PhD, is also acknowledged for his supporting input.
. The incidence and differential diagnosis of acute groin injuries in male soccer players. Scand J Med Sci Sports 1999;9:98–103.
. Long-standing groin pain in sportspeople falls into three primary patterns, a ‘clinical entity’ approach: a prospective study of 207 patients. Br J Sports Med 2007;41:247–52..
. Intrinsic risk factors for groin injuries among male soccer players: a prospective cohort study. Am J Sports Med 2010;38:2051–7.
. Hip adductor muscle strength is reduced preceding and during the onset of groin pain in elite junior Australian football players. J Sci Med Sport 2010;13:202–4.
. Effectiveness of active physical training as treatment for long-standing adductor-related groin pain in athletes: randomised trial. Lancet 1999;353:439–43.
. A systematic review of the literature on the effectiveness of exercise therapy for groin pain in athletes. Sports Med Arthrosc Rehabil Ther Technol 2009;1:5.
. Treatment of osteitis pubis via the pelvic muscles. Man Ther 2003;8:257–60.
. Osteitis pubis syndrome in the professional soccer athlete: a case report. J Athl Train 2001;36:437–40.
. Outcome of conservative management of athletic chronic groin injury diagnosed as pubic bone stress injury. Am J Sports Med 2007;35:467–74.
. Osteitis pubis in four young football players: a case series demonstrating successful rehabilitation. Phys Ther Sport 2006;7:173–4.
. Neural inhibition during maximal eccentric and concentric quadriceps contraction: effects of resistance training. J Appl Physiol 2000;89:2249–57.
. Muscle activation and perceived loading during rehabilitation exercises: comparison of dumbbells and elastic resistance. Phys Ther 2010;90:538–49.
. 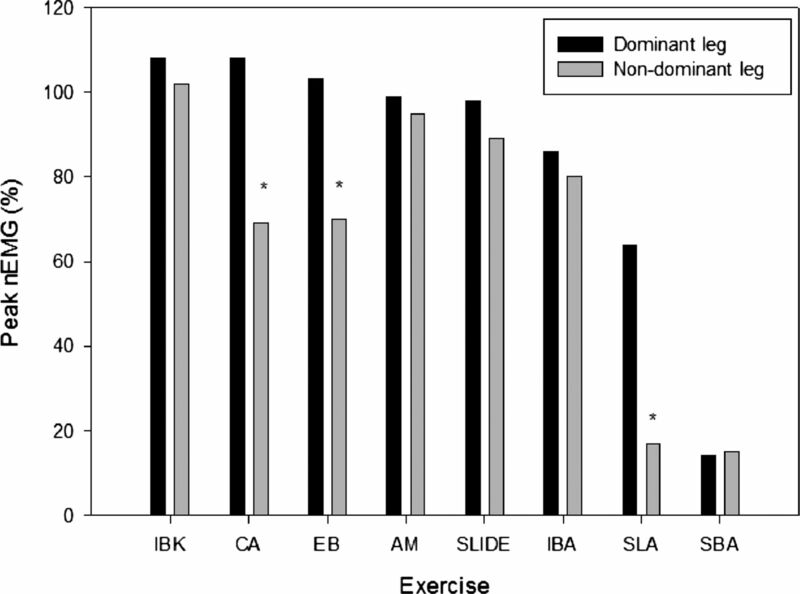 Muscle activation during selected strength exercises in women with chronic neck muscle pain. Phys Ther 2008;88:703–11.
. Neuromuscular activation in conventional therapeutic exercises and heavy resistance exercises: implications for rehabilitation. Phys Ther 2006;86:683–97.
. The Copenhagen Hip and Groin Outcome Score (HAGOS): development and validation according to the COSMIN checklist. Br J Sports Med 2011;45:478–91.
. Eccentric strengthening effect of hip-adductor training with elastic bands in soccer players: a randomised controlled trial. Br J Sports Med 2014;48:332–8.
. Dynamometry testing in spinal cord injury. J Rehabil Res Dev 2007;44:123–36.
. Muscle activation strategies during strength training with heavy loading vs. repetitions to failure. J Strength Cond Res 2012;26:1897–903.
. Evaluation of muscle activity during a standardized shoulder resistance training bout in novice individuals. J Strength Cond Res 2012;26:2515–22.
. Designing resistance training programs. 3rd edn. Champaign, IL: Human Kinetics, 2004.
, Commission des Communautés européennes Biomedical and Health Research Programme. SENIAM: European recommendations for surface electromyography: results of the SENIAM project. [Pays-Bas]: Roessingh Research and Development, 1999.
. Test-retest reliability of cardinal plane isokinetic hip torque and EMG. J Electromyogr Kinesiol 2009;19:e345–352.
. Reliability of electromyographic normalization methods for evaluating the hip musculature. J Electromyogr Kinesiol 2007;17:102–11.
. Contraction of the abdominal muscles associated with movement of the lower limb. Phys Ther 1997;77:132–42..
. Trunk muscle activation patterns during walking at different speeds. J Electromyogr Kinesiol 2007;17:245–52.
. The effect of heel lifts on trunk muscle activation during gait: a study of young healthy females. J Electromyogr Kinesiol 2009;19:598–606.
. Clinical assessment of hip strength using a hand-held dynamometer is reliable. Scand J Med Sci Sports 2010;20:493–501.
. Gluteal muscle activation during common therapeutic exercises. J Orthop Sports Phys Ther 2009;39:532–40.
. Reliability of isometric hip abductor torques during examiner— and belt-resisted tests. J Gerontol 1991;46:M47–51.
. MVC techniques to normalize trunk muscle EMG in healthy women. J Electromyogr Kinesiol 2010;20:10–6.
. The design and analysis of clinical experiments. New York: Wiley, 1986.
. Kettlebell swing targets semitendinosus and supine leg curl targets biceps femoris: an EMG study with rehabilitation implications. Br J Sports Med 2013;47:1192–8.
. Muscle activation in the loaded free barbell squat: a brief review. J Strength Cond Res 2012;26:1169–78.
. Influence of hip external rotation on hip adductor and rectus femoris myoelectric activity during a dynamic parallel squat. J Strength Cond Res 2010;24:2749–54.
. Comparison of lower extremity kinematics and hip muscle activation during rehabilitation tasks between sexes. J Athl Train 2010;45:181–90.
. Adductor muscle strains in sport. Sports Med 2002;32:339–44.
. Adductor longus mechanics during the maximal effort soccer kick. Sports Biomech 2009;8:223–34.
. Hip adductors’ strength, flexibility, and injury risk. J Strength Cond Res 2009;23:1514–7.
. Injury to skeletal muscle fibers of mice following lengthening contractions. J Appl Physiol 1985;59:119–26.
. Eccentric exercise-induced injury to rat skeletal muscle. J Appl Physiol 1983;54:80–93.
. Eccentric exercise-induced injuries to contractile and cytoskeletal muscle fibre components. Acta Physiol Scand 2001;171:321–6.
. Characterization of muscles injured by forced lengthening. I. Cellular infiltrates. Med Sci Sports Exerc 1988;20: 345–53.
. Eccentric hip adduction and abduction strength in elite soccer players and matched controls: a cross-sectional study. Br J Sports Med 2011;45:10–3.
. Hip adduction and abduction strength profiles in elite soccer players: implications for clinical evaluation of hip adductor muscle recovery after injury. Am J Sports Med 2011;39:121–6.
. An electromyographic analysis of commercial and common abdominal exercises: implications for rehabilitation and training. J Orthop Sports Phys Ther 2006;36:45–57.
. Core muscle activation during Swiss ball and traditional abdominal exercises. J Orthop Sports Phys Ther 2010; 40:265–76.
. Electromyographic analysis of traditional and nontraditional abdominal exercises: implications for rehabilitation and training. Phys Ther 2006;86:656–71.
. An electromyographic analysis of the Ab-Slide exercise, abdominal crunch, supine double leg thrust, and side bridge in healthy young adults: implications for rehabilitation professionals. J Strength Cond Res 2008;22:1939–46.
. The biomechanics of kicking in soccer: a review. J Sports Sci 2010;28:805–17.
. Chronic groin pain in an amateur soccer player. Br J Sports Med 2004;38:223–4.
. Interpretation of the surface electromyogram in dynamic contractions. Exerc Sport Sci Rev 2006;34:121–7.
. The extraction of neural strategies from the surface EMG. J Appl Physiol 2004;96:1486–95.
. Lower extremity muscle activation and alignment during the soccer instep and side-foot kicks. J Orthop Sports Phys Ther 2007;37:260–8.
. EMG activity of hip and trunk muscles during deep-water running. J Electromyogr Kinesiol 2009;19:1064–70. Contributors AS and KT contributed to the conception and design of the study. MDJ, ES and LLA assisted with the technical aspects of the exercise protocol. All authors contributed to the analysis and interpretation of the data. AS recruited all participants and supervised the exercise protocol. AS drafted the article and all authors revised it critically and gave final approval of the version submitted. Ethics approval The study was approved by the Danish National Committee on Health Research Ethics (H-3-2011-145).